Hello Horse Lovers! This site is under construction while I slowly figure out how to do this. 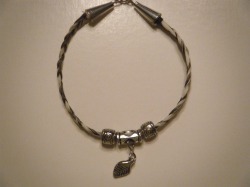 I am working on getting pics loaded of my work which consists of bracelets and necklaces right now. I am open to new ideas as well, so please feel free to drop me a line. These are just a few of my personal pieces, the top necklace is from the horse in the picture with me. 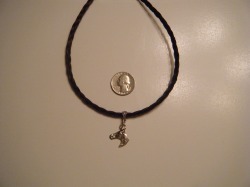 The charm was $5.00 special order. I can make bracelets with as many braids as you'd like. I can also combine hair from several horses or make separate braids and braid them together, make four part flat braids or four part round braids. I have made leatherbacked cuff bracelets (1 for Mike at the H.O.R.S.E rescue that consisted of 12 different horses, 4 braids of different colors for a "rainbow effect"...I'll load a pic of that after I get one). Please feel free to give me your ideas and desires using my e-mail (at bottom of page). I would prefer not to make one very large braid because the hair is looser and seems to catch on everything. As I make more that have the rarer braiding, I'll get those pictures uploaded as well. ALL PRICES AT THE BOTTOM OF THIS PAGE ARE FOR SINGLE BRAID ONLY. Please send only tail hair as I have discovered that manes can be extremely time consuming to work with, and quite frankly it's generally never long enough. If, for example, you have a Belgian with a docked tail and there just isn't enough tail, then by all means send the mane. I'll do my darndest to fill the order. It will probably take three times the amount of hair that I've quoted below. You can usually cut hair from the underside of the tail at an angle and it's almost impossible to see that you've cut it at all. Please don't send hair that may have "surprises" in it (the underside of the tail: you might be surprised what they hide there). I will always try my hardest to fill orders that have a deadline (i.e. Christmas presents), but each piece can take up to five hours to make. I will make them on a first come/first served basis. I can usually whip out (pardon the bad horsey pun) about 25 or more in one week using the tail hair, so please don't be afraid to send as many orders and as much hair as you want. Please make checks payable to Shelley Keegan, not the rescue as we need to keep my donations separate and to cover supplies. 50% of the proceeds go directly to the H.O.R.S.E Rescue and Sanctuary. I expect to get alot of orders, and this will be my secondary job. 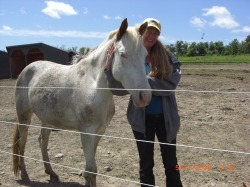 When purchasing a pre-made piece made from one of the horses at the rescue, 100% of the proceeds go back to the horses. How large a hank should I cut? If your horse has an unusually long tail, or if he/she has very thick hair, I probably will need no more than a pony tail as big around as your pinky finger. If you are ordering more than one piece of jewelry, or you would like larger or more intricate braiding, please double that amount. If it turns out that it was more than I needed, you will most likely end up with a surprise piece (meaning something I'm trying for the first time and want feedback on) included in the shipment back to you. If it's not enough hair, then I will contact you for more. 1. The clean hair, preferably tied with string or thread, even baling twine, but if a rubber band is what you have, I'll work with it (rubberbands often break the hair). If you are sending it in a baggy or plastic lined envelope, please make sure that it is thoroughly dry before packing. 2. You will also need to include any special instructions such as bracelet or necklace length, or if you have special charms, beads, or clasps that you want added. I have my own stock, but some people prefer gold, surgical steel, sterling, copper etc. I have been using typical craft store items, but will accommodate as necessary (may effect pricing, but I will let you know before beginning the project). Please feel free to send your own charms, etc. along with the tail hair or an online ordering address. 3. A S.A.S.E. to return the piece to you. You can most likely use the same type of envelope and postage for the return trip as you will use to send it to me. 4. An evening contact phone number and the general payment (according to pricing below). Please send a check or money order, no cash. I will not cash the check until the piece is finished and on its way back to you. 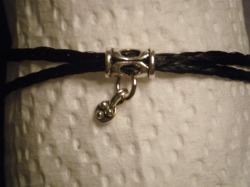 Bracelets with 1 bead are $20.00 ($17.00 if you send your own charms/pendants etc). $15.00 if you are ordering more than 1 piece. 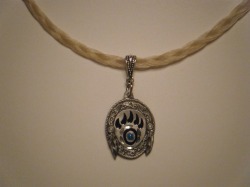 Necklaces with small pendant/charm or beads are $30.00 ($25.00 when you send your own pendant/charm). $25.00 if you are ordering more than one piece. I WILL DECREASE MY PRICES FOR THOSE OF YOU WHO DONATE REGULARLY TO THE RESCUE! THE MORE YOU DONATE, THE MORE I DROP THE PRICE! Please note: Prices may be subject to change if the weaving goes very easily, the supplies are on sale, etc. You will receive a partial refund if this occurs. Unfortunately this also may mean that I will have to increase my pricing if requested supplies go the other way (I will not increase price due to weaving difficulty, only if you send me some of those "surprises" caught up in the hair).